Good restaurant bars can be hard to find, but La Gazetta just might offer up something worthwhile on the drinking front. Although I didn’t do a full cocktail-recon, we had a round of pre-dinner drinks at the bar before tucking into their enjoyable five course tasting menu. La Gazetta is linked with the Fumoir & the former China Club (not the current one, which looks exactly the same.) Yet the cocktails here pleased me more than those at the Fumoir. 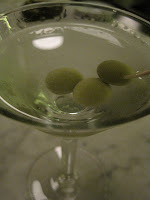 My martini was well-made with NP and Tanqueray. While Tanqueray is not my first choice for a martini, it’s a good one and much better than Gordon’s, which you’ll get in many Paris bars. 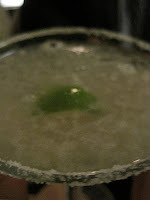 Nicky had a very well executed margarita. A bowl of olives accompanied our order. I believe the prices were around 9 Euros. The small bar area is clean, pretty & jovial and I think it definitely merits a closer look. I will and get back there in the future to sample more but would love to hear any comments on in it in the meantime. What Cheese Pairs Best with a Sidecar Cocktail? October 5, 2018 Forest Collins cheese pairings Comments Off on What Cheese Pairs Best with a Sidecar Cocktail? I think we might be living in parallel universes re the bars in restaurants. My post soon…if I ever catch up. Life is a moveable feast or something like that, right?